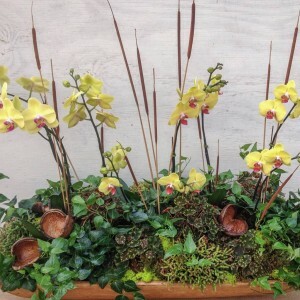 Orchids, succulents, dried pods and foliage are the common theme in these four arrangements. With the heat of summer receding (Thankfully!) and fresh material arriving to work with, it’s a happy time in the greenhouse. 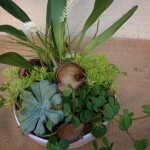 So, between new shipments of pots, plants, ribbon and more, these were a few of the pieces we created. Let’s take a look. 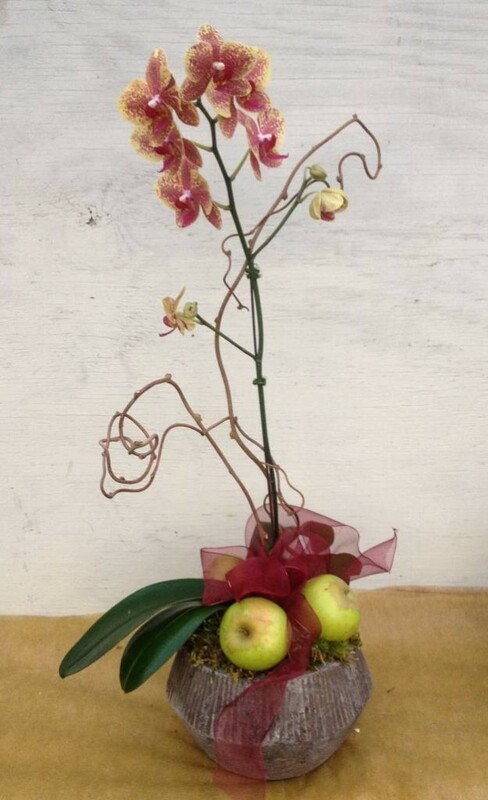 Someone who worked for us many years ago called from North Carolina to order an orchid for her mother’s birthday. 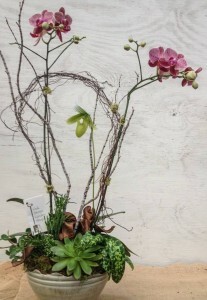 She likes succulents too; so a double stemmed phalaenopsis and a lady slipper orchid were paired in a container and succulents nestled at the base. The addition of angelvine and a touch of brown ribbon complete the design. 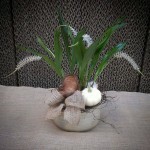 The next two small containers both started with an orchid, then succulents, ribbon, and, in the second, Jamie selected just the right white miniature pumpkin and burlap bow…the perfect gift for someone! No two designs are ever alike for us, though sometimes a customer will see something they particularly like and will request another version of it. Our least favorite thing is when someone brings in a picture with the request that we copy it, though we’ll always accommodate as best we can. Happily, this large dough bowl of a longtime customer is one we see fairly regularly and one that we have complete creative license with. This go-round I filled it with orchids and under planted it for fall with Rex begonias, a pretty ivy, and added dark, shiny pods for their color and shape. A touch of chartreuse mood moss picks up the light green veining in the begonia leaf. Some tiny cattails are placed as accents, and my design is done. Cotton stems, dried sunflower seed heads from the garden, and fern fiddleheads were the starting point for the last piece in a pretty brown and white bowl. . I added an air plant at the base and wound angel vine up through the cotton for even more interest. Some days are so much fun in the greenhouse! 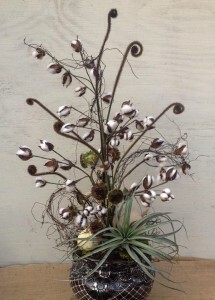 This entry was posted in Arrangements, Container, Fall, Flowers, Gifts, Indoor Plants, Orchids, Pumpkins, Succulents and tagged air plants, cotton for fall, dried sunflower heads in arrangements, fall arrangements, lady slipper, orchid arrangements, orchids and succulents, orchids in containers on October 4, 2014 by Kris Blevons.